The town of Ayutthaya is a great place to visit for a few days if you feel like resting from the nonstop buzz of Bangkok. It’s a small town surrounded by three rivers and it once was the state capital of the Kingdom of Thailand, only a 76 km train ride away from Bangkok. It’s a picturesque 1.5-hour train ride that only costs 15THB in 3rd class, on an old train filled with Thais of all ages. 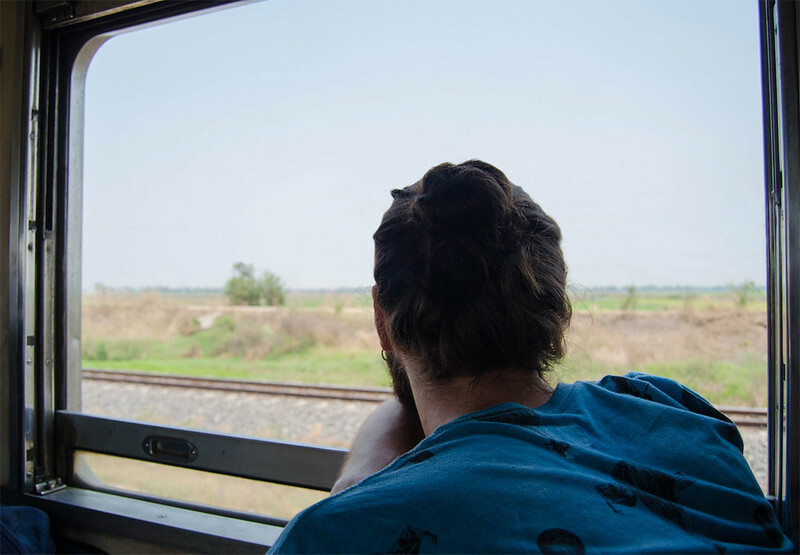 The train passes through sugarcane fields, small villages, temples, rice paddies, and plains. Being dry season we got to do the entire trip with windows opened, feeling the breeze in our faces, smelling the dust from the land and listening to birdsongs. We reached Ayutthaya painted in black freckles from the dust. If you need a snack during the trip, there will be enough vendors with food and drinks to sell at every stop. Some inside the train and others from the outside, through the windows. As soon as we got to Ayutthaya train station, a flock of tuk-tuk drivers started touting to every tourist in sight, including us. – Sir, Tuk-tuk? Where are you from? Where are you going? – No thank you. We’re good! To get into town, you need to cross the bridge or get a boat (4THB). Stubbornly, we decided to decline every tuk-tuk offer, taxi, boat crossing opportunity and did it all by foot, carrying 4 backpacks under intense heat, at 12:00 PM. Did we mention the dry season? Yeah. We ended up walking for 40 minutes until we found our hostel: One Baan Love. Or you can also pay 50THB at the entrance of each one. We decided to not buy the full ticket and choose the ones we want to get in. As in any other Buddhist temple, you’ll need to dress appropriately: no daisy dukes, bikini tops, or bare shoulders. Ladies, you should wear something appropriate as well. ? All temples open for visits at 8 AM, some of them close at 4:30 PM, others at 6 PM. Tip: if you want to enjoy some of the temples for yourself, visit them at launch hours (12:00 PM to 14:30 PM). Wear sunscreen. The temples are designed in Khmer style and most of them are in really bad shape, mainly because of the Burmese destruction back in the day: Buddhas sculptures were beheaded and stones were stolen and sold. Regardless of all that, the ruins of the ancient town of Ayutthaya are impressive! You can understand their original size and architectural detail in the mockups at the entrances. Some of the sites were under some conservation and restoration work to repair the damages caused by the floods in recent years. The temples are solid and tower-like, so even though you can climb the stairs on some, you cannot go inside. Also, some stupas are closed to the public. We were only able to visit the stupa of the Wat Phu Khao Thong. And left a whole lot to see. Looking back, we should’ve spent more than 2 days in Ayutthaya. The sunsets at Wat Chaiwatthanaram are incredible and we wouldn’t mind the opportunity to see one more. The majority of the temples are in the central part of town, so to reach the further temples, we rented 2 bicycles for 40THB each. P.S- You can find even cheaper bikes if you rent them out of the city center. Is fairly easy to rent a bicycle anywhere in Southeast Asia, plus the flat terrains and the great weather makes them the best affordable choice to move around. There is less accommodation to choose from and a bit more expensive than the capital. Restaurants do not abound, especially if you come from the jumble of street food in Bangkok—but prices are quite similar. If you get out of the temple area, you can have a good meal for 35THB. In our quest to find food, we crashed by mistake a local graduation party in an open sports field packed with food stalls and teenagers. We were hungry and new in town, so don’t judge. While we were waiting in line to get food, some locals approached us and asked to take some photos with them. Maybe the sight of two tall, bearded dudes in the middle of a high school graduation party seemed funny to them. In the interactions we had, they were kind and genuine without the ulterior motives you can’t help to feel in Bangkok. Also in several places, we found warnings about stray dogs that like to jump at people. We never had any problems, probably because our legs are too skinny for them to bother. If you must, use your tourist sword to scare them away—a selfie-stick can be a powerful weapon, use it wisely. If you have any questions or some extra info everybody can benefit from, please leave it down in the comments! We’d love to hear from you. 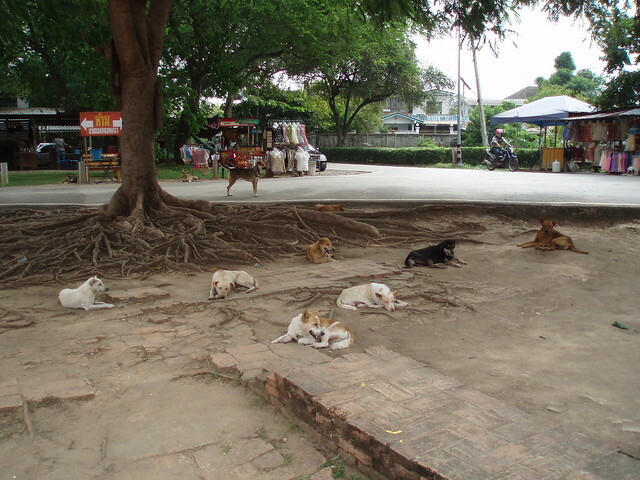 Thanks for sharing your experience in Ayutthaya. I am now working with my itinerary and this helps me a lot. Thank you. keep on travelling, guys. Looks like you guys had an awesome time! Ayutthaya was such a cool experience when we went almost 7 years ago. I remember it had rained a ton and it was practically flooded. Definitely hope to make it back their someday soon. There’s so much more on your list that we didn’t have time to see! You should definetely go back! Biking around Ayutthaya is still one of our fondest memories of Thailand.